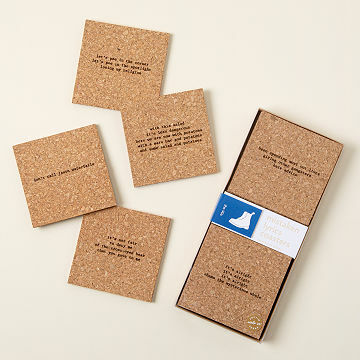 These cork coasters champion getting the words to famous songs so-completely-wrong. We all have that one friend. No matter how many times you correct them, they will always belt out "Hold me closer, Tony Danza." Embrace the hilarity of getting the lyrics to "Tiny Dancer" and other songs so wrong with these clever coasters. The cork designs come in three styles: pop diva, classic rock, and greatest hits. For pop diva you'll find favorites like "Chasing Penguins." Classic rock includes hits like "I Wanna Hold Your Ham." And then there are the greatest hits, with tunes like "Hit Me With Your Pet Shark." Each set of six laugh-out-loud coasters makes a memorable housewarming or "just because" gift. Our suggestion: Use them to spark a round of mistaken lyrics karaoke. Designed by Eve Trester-Wilson and Kristen von Minden. Made in Austin, Texas. Fun fact: This odd (and hysterical) phenomena has a name. The word "mondegreen" originates from a misheard bit of an old Scottish ballad. href="https://www.uncommongoods.com/pdf/48288_places.pdf" target="_blank">PDF of all 50 states. Eve Trester-Wilson and Kristen von Minden are friends with a few shared obsessions: architecture, power tools, and crafting. So naturally, when it came time to start a career, they put their skills together and got creating. They invent, produce, and sell high quality, handmade designs that will make you smile. Each of their products is created in their workshop in Austin, Texas, which is equipped with a laser cutter, lots of wood, colorful acrylic, cork, and paper. The duo says, "[we] put our hearts and our hands into everything we make." Wipe clean with a damp cloth. Do not bend coasters. They're a perfect conversation started and something we can all relate to. Especially Tony Danza! My new go-to for the friend who has everything! Can't wait to see my friend's face when he opens these!! This product make me chuckle! This is a gift- but there are coasters on all my surfaces! You have to "respect the wood!" I make Uncommon Goods purchases because I like to shop ethically and locally. And UG has quirky, fun and unique products for gifts. These are such a fun, practical conversation piece! I bought two sets of these coasters and they're perfect. We haven't used them yet but I did check them out before wrapping them. They look great! Exactly as pictured. I would definitely buy again.